Nelu (pronounced knee-loo) Handa is a Toronto actor, comedian, writer and producer. Known for her performances on Workin’ Moms, The Beaverton, Odd Squad and Almost Genius, Nelu is also a writer and performer on the Baroness Von Sketch Show and the creator, producer and host of YAS KWEEN, a monthly comedy night that showcases start-up, sketch and improv by women of ethnicity. If you could describe yourself using 280 characters – a tweet! – what would you say? I do comedy stuff. Acting, writing, producing, community building. I enjoy coffee, DIY projects, cooking and brevity. Is there a moment or experience you had growing up that you think propelled you to pursue a creative profession? I used to impersonate Elvis singing “Heartbreak Hotel,” which started when I was about seven. I’d do it for everyone who came into my house, even though I only knew the chorus, lip flair and hip twitching. I think I felt inspired by Eddie Murphy’s turn as James Brown in the Hot Tub Party sketch on Saturday Night Live. Getting laughs from adults felt like I was being seen and that felt real good. You graduated from Wilfrid Laurier University’s Business program and later, you began studying at The Second City. May you share what your journey was like from undergrad to The Second City? I worked in marketing and earnestly tried to pursue the career path. I never quite felt like I found my power in those roles, so I often felt dissatisfied at work. After getting let go from a position, I had a period of unemployment (and a resulting depression). I needed to get back to feeling like myself, so I signed up for a weekend Level A intensive at The Second City. I got hooked, I didn’t have an intention to pursue comedy as a career, but it was a dream I had held since I was very little. Eventually, I found the confidence to give up my corporate life to pursue a career in the arts full-time. You’ve spoken about how being a Canadian-born-and-raised Indian woman in comedy is somewhat new for mainstream audiences. What is one of the challenges you’ve had to face in the industry, as a result? I think it’s natural for people to try to categorize you, so when I used to say I do comedy, people sometimes responded, “Oh, like Russel Peters?” or, “Ya, you do actually look like Mindy Kaling too.” It’s nice to be compared to very successful people, don’t get me wrong, but it does expose a lack of diversity if the only thing they could see is being a copy of other successful Indian comedians. I don’t know that happens much for people who aren’t in marginalized communities. What do you hope your work does to lift barriers and stigmas that surround being a woman of colour (WOC) in comedy? To normalize us for an audience and inspire others to shake off the voices that say, “You’re not allowed to do this,” if it’s something their heart wants to pursue. Based on your experiences in the industry so far, do you have any advice for other people of colour (POC) hoping to get into comedy or acting? Believe in yourself. In spite of the voices in your head or your parents’ expectations or the obstacles you imagine. If you know it’s right for you, go get it. Also, try not to worry about making money at first. Do your full-time gig/side hustles. It takes time to make a livable income from the arts. Find patience. And be kind to everyone you meet. Nobody wants to work with the jerks. You’ve performed and written for the Baroness Von Sketch Show, you play Jade on Workin’ Moms, you produce the live show YAS KWEEN and you’re open about the marketing consulting work you do. What’s a day in the life of Nelu? How do you get everything done? Everyday is different. I’ve started taking things off my plate so I can just focus on the most important work to do – prepping for auditions, working on show pitches, taking care of myself (self-care is no lie). I know my priorities and I have very understanding loved ones who know work projects come first for me. I make sure to have balance as much as possible. I like to think I went from a nine to five to a 24/7. This career is very all consuming! YAS KWEEN launched in the fall of 2015. Since then, how has the project shifted and grown? There’s something to say about longevity – the audience keeps coming and we always have new performers coming through, so I think it’s something the scene needs and wants. I’m proud of the community we’re building. I have met many WOC who ask me to try stand up for the first time at YAS KWEEN and it makes me happy to see they feel like they have a space to get up there and try their comedy in a really warm room. We have a very diverse crowd who comes, and that feels like we’re helping to normalize having funny WOC on more than just our stage. May you share an overview of some of the new projects you’re working on throughout the coming months? Is there one that you’re particularly excited about? If yes, why? Got something in the cooker with my writing partner for TV. I’m a bit superstitious, so that’s all I’ll say until papers are signed!!! It’s a new story for the world, and that excites me. The creative process is different for everyone, but most people experience both highs and lows. Are there ever moments in your journey where you feel uninspired? How do you work to combat these incidences? ALL THE TIME. I get into funks and it takes time to shake them off. But I know I always do, and it’s usually by getting support from friends and colleagues – also therapy is primo! Getting on stage, getting exercise, eating well, talking my squad’s ears off – they all help to combat my lows. Who is one of your mentors and/or inspirations and what have you learned from them? Carolyn Taylor, one of the creators of Baroness Von Sketch Show, has really provided great inspiration in helping me believe in myself as a writer and performer. She does it with kindness, generosity, and encouragement, and it’s an example I hold dear to my heart. On the topic of lessons, what is a lesson you’ve now learned that you wish you could share with the teenage version of yourself? It’s okay to be the different one. I’m on all the social meeds under my name (@neluhanda). Also, YAS KWEEN has a Facebook page and updates are posted on social under #YasKweenTO. Photo by: Sarah May Taylor. See more of Nelu’s work in The COMBUSTIONfestival at Bod Dog Theatre on Sat. June 9. 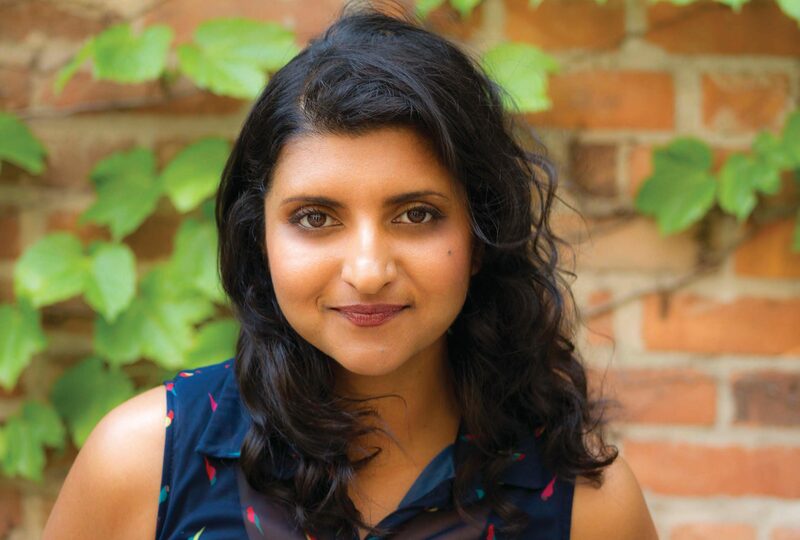 Here, Nelu is the director of The Kweendom, an improv comedy troupe of ethnic women, who also make up the YAS KWEEN team, and they will perform at 7:00 p.m. on the aforementioned date. Get your tickets to The COMBUSTIONfestival here. And, YAS KWEEN’s next show in Toronto is on Thurs. July 5. Visit facebook.com/YasKweenTO for more information. The feature photo is by Sarah May Taylor.